When the air is clear, sixteen-year-old Drew Ferran can pick up the scent of a predator. When the moon breaks the clouds, a terrifying fever grips him. And when a vicious beast invades his home, his flesh tears, his fingers become claws and Drew transforms . . .
Can Drew battle the werecreatures determined to destroy him- and master the animal within? Lycanthropy, lack of wizards, a touch of necromancy (yes, zombies! 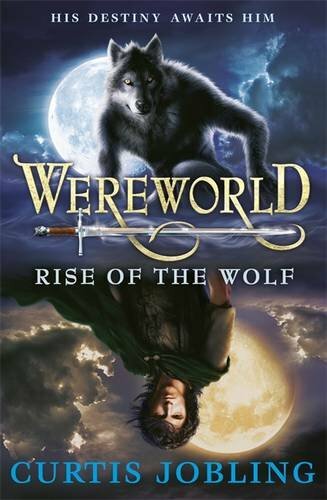 ), and Therianthropism (think of the Ancient Egyptian Deities and this is a subject that fascinates me, especially Clinical Lycanthropy), what more could you want in a fantasy? Apparently wanting more isn’t for me because this is my type of fantasy. No relying on fantastical fantasy wizards, elves, dwarves, magical weapons to decide fates, rings to rule them all, or horrible fantasy clichés, this is one of those fantasies I enjoy reading and will go on that part of my shelf where I put what I deem the pleasant and enjoyable fantasy. The fantasy I will remember because it’s not the same as the usual recycled and tired old story. First thing I really liked about Wereworld: Rise of The Wolf, by Curtis Jobling, is when some characters blacked out. Ok, I’m sure you’re thinking, how strange are you Bonnie, you like them blacking out? It’s a well known plot device usually employed to help move the scene along to some thing else and the character along with it, I’m sure most readers have come across it enough to recognise it, and it can be pretty annoying at times even if it is necessary to the story. What I liked about these blackouts is that even though we’re following the story about one particular character, the whole novel is in third person so we aren’t stuck with him when he does blackout. Instead of just picking up from when he wakes up we get to see what happens during him being unconscious (or whatever character it is) from the other characters. This makes me happy. There’s also a little surprise in there that actually surprised me, but it’s possible that piece of knowledge could make the story predictable at some point. Of course it could go in several directions and it might not be anything except as a lesson (which I’ll mention later). The point is it’s hard to surprise me, shock me, or completely bamboozle me when it comes to reading. There’s so much fiction out there, so much make believe and imagination put to use, that we are bombarded with worse case scenarios or deviations of what might happen that it can be hard to be surprised. I think half of my problem with surprises is I’m also seeing it from a storyteller’s perspective so I naturally see all the paths it can take. I can’t help it, so when I am surprised I appreciate it a great deal and I think that’s some pretty clever writing if you can surprise someone who is on the desensitised surprise side of things. In saying that though, I think it also shows how much someone can be presumptuous even when they try not to be, and it is something that is pointed out later in the story by one of the characters. The ending was a bit bumpy for me because of the impossibilities (more like what I saw as impossibilities), but given the supernatural abilities of these creatures it makes sense and overall it doesn’t mar the story. I really did find it hard to put down, even getting frustrated with having to stop for sleep (I love stories like that). I enjoyed the descriptions because it’s just enough to paint a picture, but not overly done so the reader can let their visualisation go to work. The characters are all well written and not only easy to identify from each other, but easy to identify with, and I really like the idea of a world ruled by Therianthropes rather than some crazy wizards who fight by throwing magic at each other and babble prophetic nonsense (cliché, cliché, cliché!). All in all, I’m really looking forward to the next book and if it was around I’d be reading it now. P.S. One last thing – I’m a sucker for maps. It has a map! I love maps. The writing is a bit small in some parts, but I still appreciate the map. Reminds Me Of: A little bit of John Flanagan (Ranger’s Apprentice) in writing style and maybe a bit like Markus Heitz (War of The Dwarves) in using a different spin. I love your transitions and clarity. I have been producing for Ghost Writers for a while now, and they pay me very well to write blog posts like this, or articles. I clear $100-$200 on a bad morning. Judging by your ability with words, you may enjoy doing the same. Oh wow, thanks for letting me know about that. It looks interesting, I’ll check it out.